So Oregon Trail, for the Apple 2, was made by MECC, Minnesota Educational Computing Corporation. We two GenXtinct founders are Minnesotans, but I know the game spread behind our state's borders. What made it so memorable? Was it simply that it was one of the first computer games schools got behind and let kids play? Was it the simplistic graphics? The fact that everyone eventually died of dysentry? One fan reminisces about it here. 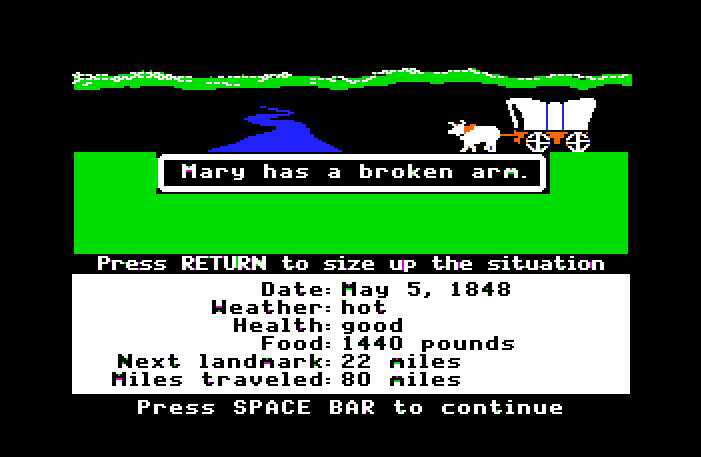 I am amazed that Oregon Trail STILL EXISTS TO THIS DAY. They just keep making it in every single permutation of computer device! I've played it on the iTouch and iPad and you can even fish with it now!